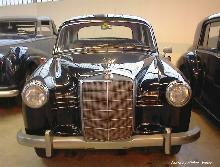 Mercedes added a new model to its range in 1956, the 190 saloon. The 190 bridged the gap between the 180 and the 220 models, but shared its bodyshell with the smaller of the two (the 180). The 190 featured a revised rear suspension layout, an all-synchromesh gearbox and optional servo-assisted brakes. The 190 used a 75bhp, 1897cc four cylinder, overhead cam engine which was later used in the 180. 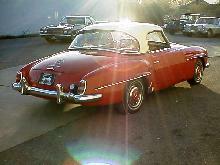 Apart from the mechanical improvements the 190 also enjoyed better trim, equipment and extra external chrome. Thanks to the better trim the 190 looked less austere than some of the other small Mercedes saloon models and sold well until 1961. 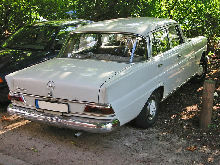 1960 190Db, with the wider, later grille than pre 1959 180 and 190 models. 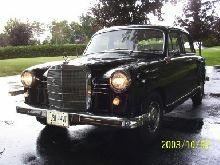 Car sits in my drive just outside Prescott Ontario Canada. I call him Fritz, after an old German family friend.